Asymmetric cell division is the process by which a cell divides into two cells that are different from each other. This type of division generates diversity in cell populations and is essential for the development of multicellular organisms, such as plants and animals. Manuel Mendoza's team at the Centre for Genomic Reguation (CRG) and currently at the IGBMC in Strasbourg (CNRS/Inserm/Unistra), discovered a new mechanism for regulating cell fate during this division in cells of the yeast Saccharomyces cerevisiae. Researchers showed that a chemical modification of protein complexes on the nuclear enveloppe, known as nuclear pores, leads to changes in their functions and influences cell differentiation. This study has been published in the journal Nature Cell Biology. An essential process for life, cell division allows a cell to divide into two daughter cells. This fundamental mechanism allows growth and regeneration of organisms. A special type of cell division is asymmetric division, in which an uneven distribution of cell fate determinants between the two new cells leads to their different identities. In this study, researchers studied budding yeast cells, which divide asymmetrically to generate a mother and a daughter cell. They discovered that a chemical change of nuclear pores in daughter cells is essential for their unique identity. Nuclear pores are large protein complexes that form channels in the envelope that separates the nucleus (which contains genetic information) from the rest of the cell. Nuclear pores therefore act like small doors that allow movement of molecules in and out the nucleus. They can also interact with genes inside the nucleus to regulate their activation. Researchers identified a protein that specifically associates with the nuclear pores of the daughter cells during its division, and removes a chemical modification on these pores, called acetylation. Differences in nuclear pore acetylation between mother and daughter cells cause differences in the transport of molecules into the nucleus, and in the interaction of genes with nuclear pores, which ultimately lead to different cell division times in mothers and daughters. 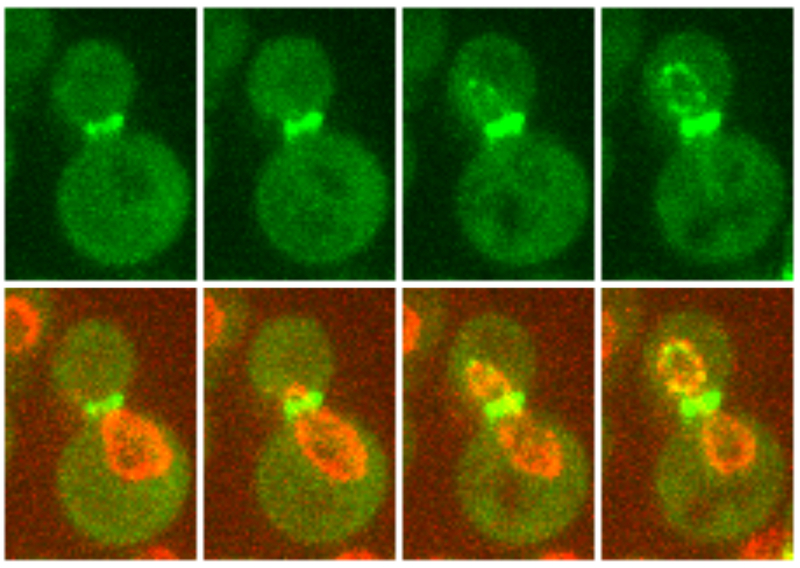 Acetylation of nuclear pores has been previously observed in human cells, but the function of this modification is unknown. Thus, these results open up the possibility that nuclear pore deacetylation could be a mechanism to regulate the functions of nuclear pores and the determination of cell fate also in human cells that divide asymmetrically, such as stem cells. Future studies in this direction may reveal novel principles of how human stem cells and tissues are maintained, and of pathologies associated with defects in these processes, such as developmental disorders and cancer. This study was supported by the European Research Council (ERC) Starting Grant 2010-St-20091118 to M.M., the Spanish Ministry of Economy and Competitiveness, ‘Centro de Excelencia Severo Ochoa 2013–2017’, SEV-2012-0208 to the CRG and the grant ANR-10-LABX-0030-INRT, which is a French State fund managed by the Agence Nationale de la Recherche under the frame programme Investissements d’Avenir ANR-10-IDEX-0002-02 to the IGBMC. M.G.-A. is a recipient of a Postdoctoral Fellowship APOSTD/2017/094 from the Generalitat Valenciana.